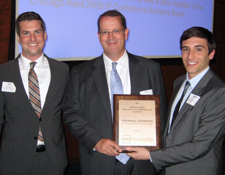 It's been a busy spring for the Chicago-Kent Alumni Association! Check out photos from some of our recent events at www.alumni.kentlaw.edu/photos. In less than two weeks, the Class of 2012 will join our alumni community at the 2012 Chicago-Kent Commencement. This year, we are honored to welcome two speakers for the ceremony—Her Royal Highness Princess Bajrakitiyabha Mahidol of Thailand, and Laurel Bellows, president-elect of the American Bar Association and member our Board of Overseers. The ceremony will be held at the UIC Forum, 725 W. Roosevelt Rd., in Chicago on Sunday, May 13 at 2:30 p.m.
Fifteen of our alumni will also participate in the ceremony as alumni "hooders," conferring the JD hood on a family member during the ceremony. 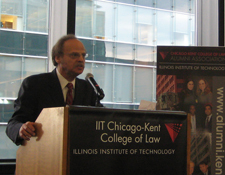 This tradition is symbol of the strength of the Chicago-Kent alumni community and a testament to the support these students have received from family and friends throughout their law school career. I invite you to follow along with the day's activities online—whether through the live webcast of the ceremony, or with photos and posts on Facebook and Twitter throughout the day. All will be available on May 13 at www.kentlaw.iit.edu/commencement. Please join me in congratulating the Class of 2012 and welcoming them to the alumni community. Patrick Ferrell '13 and Kylin Fisher '13 received Justice John Paul Stevens Fellowships to spend the summer working in unpaid public interest positions. The Justice Stevens Fellowship program at Chicago-Kent was developed and funded through the generous support of Professor Nancy Marder, who served as a law clerk for Justice Stevens. This is the second year these fellowships have been awarded. Join us for the 2012 Trial Advocacy Alumni Reunion on Tuesday, June 12, at Haymarket Pub & Brewery. The reception and dinner will begin at 5:30 p.m., with awards presented at 6:30 p.m. Stay tuned for more details! Sunday, May 13, 2012 | 2:30 p.m.
Watch live online at www.kentlaw.iit.edu/commencement. 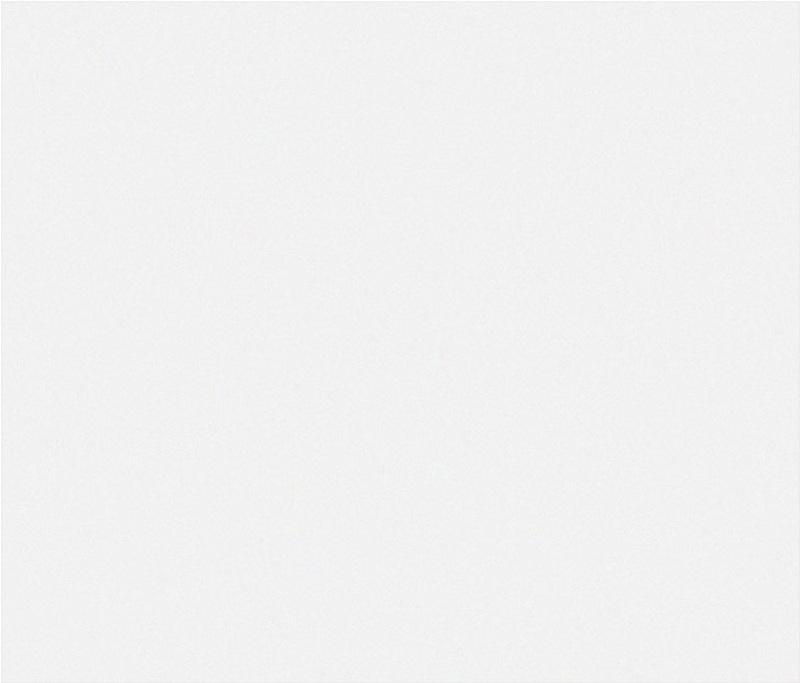 Wednesday, May 23, 2012 | 6:30 p.m. Eligible for 4.0 hours of IL MCLE credit including 2.0 hours of professionalism/ethics credit. Eligible for 9.0 hours of IL MCLE credit. The Institute for Law and the Workplace celebrated 15 years as a resource for the labor & employment law community on April 18. Click here to see photos. (L-R): Joseph Janas '12, Thomas J. Donovan '87, and James Alex '13. 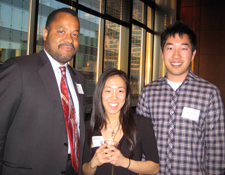 (L-R): George Jackson '85, Jessica Ryou '14, and Phillip Hwang '14. Professor Marty Malin emcees the program speakers. 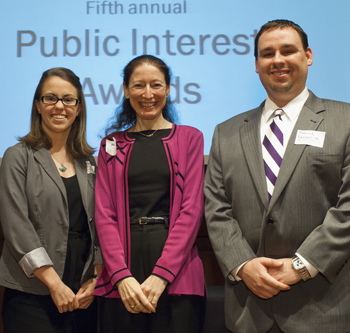 Chicago-Kent alumni, students and faculty were honored at the annual Public Interest Awards Night for their commitment to public interest work. Click here to see photos. 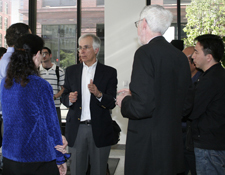 Prof. Austin D. Sarat speaking with guests at the 2012 Centennial Lecture reception. Back row (L-R): Roy C. Palmer '62 and Susan Palmer. 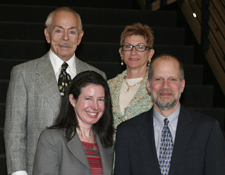 Front row (L-R): Prof. Laura Dickinson and Dean Hal Krent. 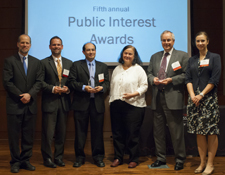 2012 Alumni Awardees (L-R): Dean Hal Krent, Paul Haidle '07, Victor Perez '01, Zena Naiditch on behalf of Equip for Equality, Jim Reichardt '77, and Mari Monteiro '04, also on behalf of Equip for Equality. create and maintain valuable professional connections, and stay current on upcoming events. Click here to see a directory of all of the social media activity at Chicago-Kent.